Measure blood pressure and stress throughout your daily life. UC San Francisco is conducting a study on how emotions, stress, and daily experiences affect blood pressure changes. Participants can receive immediate feedback on blood pressure levels and how it changes throughout your day and in response to different activities. Understand how stress and daily experiences affect your health. You will start to receive personalized information regarding stress, emotional level, and physiological responses during different situations. You will also receive generalized information about ways to manage stress level and important facts regarding how stress affects your brain, body, aging, and performance. Three-week engagement helps to study how stress and daily experiences affect blood pressure levels from day-to-day. pressure measurements a day along with a short set of tasks. After the first week, you will start receiving personalized feedback on your stress levels. After the three-week program, you can continue to obtain readings and will receive updated personal feedback. The app content was developed and informed from decades of research on stress, health and blood pressure and obtains the key critical predictors of blood pressure levels, and stress effects on health. Users will be able to obtain their blood pressure responses, contextualized to their situation, so they receive the most accurate information regarding helpful versus harmful effects of stress on their body. The app will collect critical demographic factors, psychological and personality traits, and daily stress and emotion functioning. Users will have the option to enroll in a three-week study that will obtain their blood pressure and daily experiences three times a day. 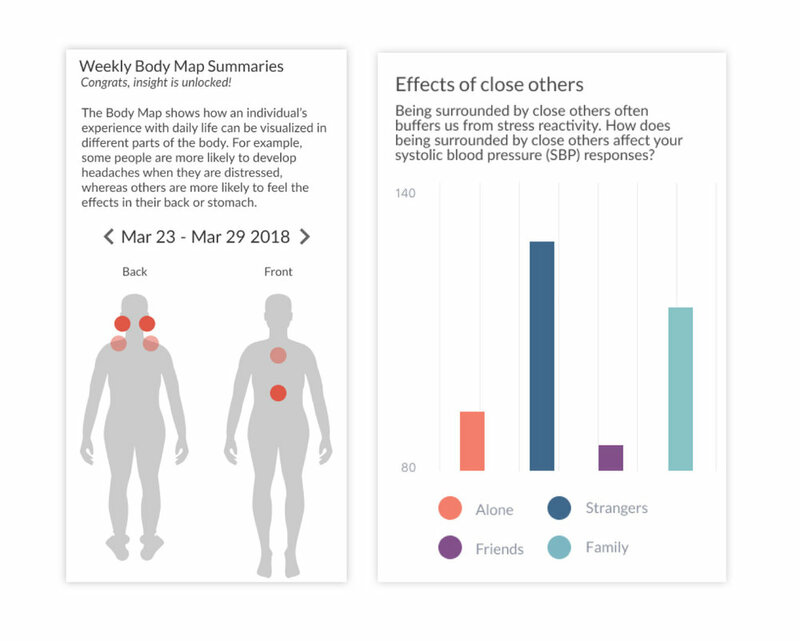 After the first week, users will start receiving personalized information regarding their stress and emotion levels and their physiological responses during different situations. This tailored information becomes more specific and personalized with the additional information collected. In addition to tailored information, users will also receive generalized information regarding the best ways to manage stress levels, and important facts regarding how stress affects their brain, body, aging, and performance. After three weeks, users can continue to interact with the app and will receive updated personalized information.